Thermostats are devices designed to control the heating and cooling systems in a building so that air temperature remains comfortable. According to InterNACHI’s Standards of Practice, inspectors are not required to verify, inspect or determine thermostat calibration, heat anticipation, automatic setbacks, timers, programs or clocks. It is wise, however, for inspectors to understand thermostat operation and solutions to common defects. on an outside wall. Outside walls are too affected by outside temperatures, which may make the thermostat “think” the air in the house is warmer or cooler than it really is. a thermostat that doesn’t respond to changes in room temperature. This can happen when there is air passing over the temperature sensor from a hole in the wall behind the thermostat, through which wires enter from the air-handling unit. To rectify this, insulate the hole behind the thermostat with insulation, spray foam, or any other insulating material. temperature that is inaccurate. A convenient way to test the temperature sensor is to tape a thermometer to the wall next to the thermostat and wait 15 minutes. A faulty thermometer needs to be recalibrated. Instructions for recalibration vary by manufacturer. Give the thermostat’s interior a light dusting with a small, soft paintbrush. Canned air can also be used to blow off dust. Twist the screws to remove the cover. Be sure to clean the contacts, which are small metal plates within the unit. The wires coming from the transformer attach to the contacts. Do not touch any of the interior parts with fingers. For wireless thermostats, make sure the model number of the thermostat matches the model number of the receiver. If the model numbers do not match, the stat and receiver will not be compatible. 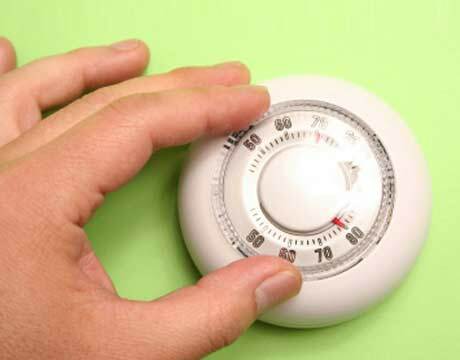 According to the U.S. Department of Energy, consumers can save 10% on their utility bills by setting their thermostat back 10° to 15° for eight hours. This can be accomplished easily with a programmable thermostat. Be careful not to set the thermostat so low in the winter that pipes freeze, or so low during the summer which may allow humidity-spawned mold to grow. In summary, thermostats are used to ensure the comfort of building occupants through the proper control of the heating and cooling cycles.